Joanne is the Director of Physical Therapy at PhysioSource. She received her Master of Physical Therapy degree from the University of Michigan in 1994. Prior to opening PhysioSource in 2003 she worked as a physical therapist in a variety of clinical settings including inpatient acute care and outpatient rehabilitation, geriatrics and orthopedic/sports medicine. Her primary interests are aquatics, outpatient orthopedic, and industrial rehabilitation. In her sixteen years in the Toledo area, she has developed a reputation as an outstanding physical therapist in this community. In her free time she enjoys spending time with her husband and children, traveling, and spending as much time as possible at their cottage on Devils Lake. Colleen is a registered kinesiotherapist, Office Manager, and Director of Community Relations and Marketing for PhysioSource. She received her Bachelor's degrees in Kinesiotherapy and Human Performance at the University of Toledo in 1983. Colleen has significant experience in musculoskeletal rehabilitation and has practiced in the field of outpatient rehabilitation for over 25 years. Her past experiences include the development of aquatic rehabilitation programs, outpatient co-treatment of orthopedic patients, and instruction in back education classes at numerous industrial sites. s the office manager for PhysioSource, Colleen is a patient advocate and liaison for the patients to assure the highest quality of care in an efficient effective manner. Colleen has been a charter member of the PhysioSource team since 2003. In her free time, Colleen enjoys outdoor activities with her husband and three children to include hiking, biking, backpacking, and skiing. Daniel received his Bachelor's degree in Biological Sciences from Capital University in 2012, in which he then went on to the University of Maryland, Founding Campus where he earned his Doctorate in Physical Therapy in May 2015. He recently moved to the Toledo area from Maryland in the summer of 2015 to be with his now wife. Upon graduation, Daniel wanted to focus on his career and work in the outpatient orthopedic setting which led him to his employment at PhysioSource Physical Therapy. His interest in orthopedics and sports rehabilitation stem from his time playing high school and college sports. Though he treats a wide arrange of ailments, he has an increased interest in the shoulder, knee and hip joints, along with athletic injuries. He also spends time helping out with the aquatics therapy program. In his free time, Daniel enjoys playing soccer, bike riding, exercising, and spending time with his wife and friends. He is 1 of 3 health professionals in the Toledo area with Functional Movement Screen Certification, specializing in assessing movement patterns and identifying movement dysfunctions in athletes and general public. Sean graduated from Denver Technical College (1996) in Colorado where he lived and worked for four years before moving East. 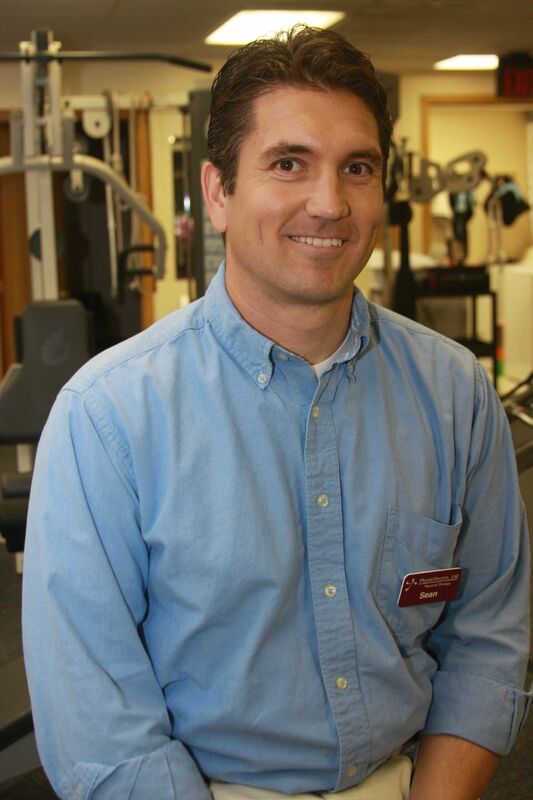 He has over 15 years of physical therapy experience. Sean's background is well rounded with experience in inpatient rehabilitation, home health care and outpatient practice where he has spent most of his time. In the outpatient setting he has had the opportunity to treat patients ranging from neurological to orthopedics. He has also had the opportunity to facilitate and work with aquatic therapy treatments. In his free time Sean likes spending time with his wife and kids. He also enjoys coaching, playing and watching sports. Sean has been a valuable member of the PhysioSource team since 2006. Angela graduated from The University of Toledo in 2001 with a Bachelor of Science Degree in Physical Therapy, completing Physical Therapy School at The Medical College of Ohio. She has spent her career practicing in the outpatient orthopedic setting, both hospital based and private practice, treating a variety of patients of all ages. Her continuing education has focused on The McKenzie Method of Mechanical Diagnosis and Treatment, The Mulligan Concept, and manual therapy clinical skills. Angela joined the PhysioSource Physical Therapy staff in 2013 after returning to the Toledo area where she was raised. Angela finds great reward in assisting her patients achieve their goals and improve their quality of life, while attempting to make physical therapy a comfortable and enjoyable experience for the patient. In her free time, Angela enjoys spending time with her family and friends, and is an avid sports fan having grown up participating in athletics. At PhysioSource, Carolyn is our Medical Billing and Coding Specialist. Carolyn enjoys having the I's dotted and the T's crossed. Carolyn is a valuable team member keeping up with the ongoing changes in the medical billing world. She received her medical billing certification in 2000 and her Certified Professional Coder credential in 2006. She is an excellent resource and advocate for our patients with respect to their insurance billing. Carolyn has been a loyal team member of PhysioSource since 2003. In Carolyn's free time she enjoys spending time with family and friends. Cathy received her Bachelor's degree in Arts and Sciences from Vanderbilt University in 1997. She then taught Spanish at St. Johns Jesuit High School in Toledo for almost ten years. Cathy then decided to embark on a second career and graduated from Owens Community College with a degree as a physical therapy assistant in 2017. Shortly thereafter Cathy joined the PhysioSource Physical Therapy staff and has greatly enjoyed assisting the patients and working with the experienced and innovative team. In her free time, Cathy enjoys spending time with her three children and family. She also enjoys traveling, working out and, more recently, painting.